Many governments have recently moved the promotion of biofuels to the top end of their priority list. Developed countries are motivated in particular by their ambitions to reduce greenhouse gas emissions and enhance their energy security, whereas many developing countries are interested above all in counteracting the constant rise in energy prices and creating new income opportunities in agriculture. Biofuel refers to all types of fuel that are produced from biomass. Today, this applies mainly to bioethanol (made from crops such as sugarcane or maize) and biodiesel (usually made from rapeseed or palm oil). More efficient production methods are currently being developed, with a view to enabling production of second-generation biofuels from cellulose (e.g. from grasses and shrubs). Two new publications and a set of conference papers show that while the cultivation of biofuel feedstock crops does represent an opportunity, particularly for developing countries, it is nevertheless also linked to various risks and problems. 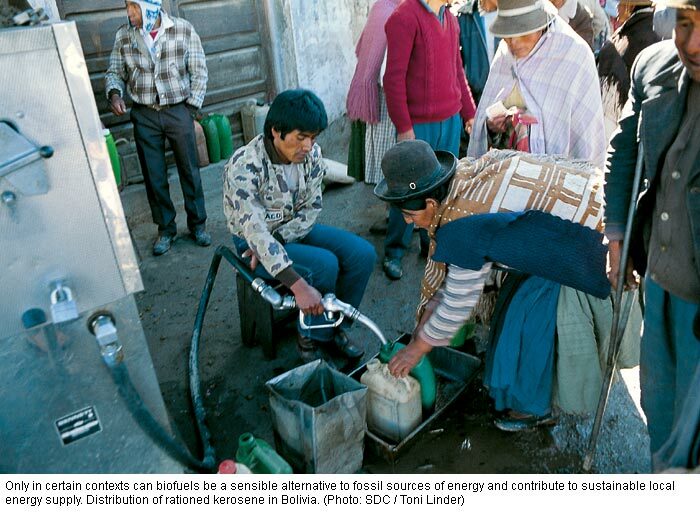 Developing countries have a comparative advantage in biofuel production. Tropical feedstock crops such as sugarcane and oil palm rank particularly high in terms of energy efficiency, whereas production costs are relatively low. Moreover, biofuels can diminish expenditures for petroleum imports and thus help to reduce energy prices. At the same time, however, biofuels compete with food production, thereby causing an increase in food prices. While this is certainly a benefit for food-producing farmers, rising food prices mean disaster for millions of poor urban consumers. The degree to which developing countries can profit from biofuel exports depends decisively on international trade regulations. Developing countries will have a hard time as long as industrialised nations continue to support their domestic production with massive subsidies and maintain import tariffs on processed fuels. Biofuels have the potential to reduce the greenhouse effect, since in a certain sense they are carbon-neutral. Energy crops absorb carbon dioxide from the air and later release it during combustion. However, the benefit of biofuels over fossil fuels in terms of carbon balances is influenced by two additional factors: the amount of energy required to cultivate and process the crops, and the previous use of the land where biofuel feedstock is grown. The carbon balances of biofuels quickly lose their appeal in cases where cropland is made available by destroying vast forested areas, as it is currently done for oil palm plantations in Indonesia. A further crucial factor is the increased requirement of natural resources that accompanies biofuel production. Currently, biofuels still account only for a small share of global agriculture. Nevertheless in many regions the agricultural potential is already realised to the full. Countries that invest in biofuels on a large scale, such as China and India, will very soon reach their limits in terms of water supplies. Only by defining clear framework conditions at the national and international levels will it be possible to ensure that biofuel production can benefit the environment and rural development. New production methods will increasingly make it possible to produce biofuel from food crop side products and undemanding plants in marginal areas. Decentralised production combining food and energy crops, along with local processing of the latter into biofuels, could certainly prove interesting for poor rural populations. >Linkages between Energy and Water Management for Agriculture in Developing Countries. Papers of an International Conference organized by IWMI and FAO in Hyderabad, India, 29-30 January 2007. > Bioenergy and Agriculture: Promises and Challenges. Peter Hazell and R. K. Pachauri (Eds.). IFPRI 2020 Focus No. 14. December 2006. 28 p.
> Biofuels production, trade and sustainable development: emerging issues. Annie Dufey. IIED Sustainable Markets Discussion Paper Number 2. November 2006. 62 p.
Without improvements in water productivity, food production will consume nearly twice as much water in 2050 as it does today. This is one of the main statements made in the Comprehensive Assessment of Water Management in Agriculture. The 700 experts involved see possibilities for enhancing water productivity, and thus slowing the increase in water consumption, through a combination of different measures that call for change not only at the technical, but above all at the institutional level. Thereby, soil and water conservation in rainfed agriculture plays a pivotal role both in reducing poverty and in conserving ecosystem functions. The report hardly questions consumer behaviour – high meat consumption in particular – in developed countries. But it clearly demonstrates that difficult negotiations of conflicting interests lie ahead in the future. These negotiations will have to determine the relations between contrary concerns, such as water for food versus water for ecosystems, increasing productivity at any cost versus equitable, sustainable production, and the needs of people living upstream versus the interests of downstream populations. Decisions are frequently determined by power structures. The editor of this report and two experts confirm in an extensive interview that questions of ethical values and equitable compensation mechanisms are increasingly gaining importance against this background. However, in this respect the report cannot do more than roughly outline possible solutions. > Water for food, Water for life. A comprehensive Assessment of Water Management in Agriculture. Comprehensive Assessment of Water Management in Agriculture. 2007. London: Earthscan, and Colombo: International Water Management Institute. Around thirty cases from the four corners of the globe bear testimony to the role of forests in the achievement of the MDGs. Due to a combination of internal and external reasons, the main protagonists in the international forestry scene, however, failed to take their rightful place when setting these goals. No consideration was given to new dynamics, such as avoiding deforestation in the light of climate change, the production of biofuels linked to the forest, or land use. The present publication aims to redress the balance by providing an overview of forest-related activities which help reduce poverty. For example, the roots of the International Model Forest Network (IMFN) lie in Canada’s Model Forest Programme, which was created with the aim of integrating different interest groups as partners in sustainable forest management. Several of the defining characteristics of a “model forest” have generated many positive results, which also meet certain Millennium Development Goals. For example, in developing countries, model forests play an active role in promoting participation and governance, thereby ensuring environmental sustainability (Goal 7) and contributing to global partnerships for development (Goal 8). Source: Forests and the Millenium Development Goals. European Tropical Forest Research Network, ETFRN News No 47/48. 2007. 94 p.
Over the past ten years an increasing number of countries has begun to grow genetically modified (GM) crops. However, this trend is almost exclusively limited to maize, soy, cotton and rapeseed varieties that are herbicide tolerant and/or resistant to pests. According to Friends of the Earth International, these plants have not yielded any benefits for farmers so far. A global evaluation has shown that the productivity of GM crops has not been higher than that of conventional crops, and that the use of pesticides has not been reduced. Weeds are slowly becoming resistant to herbicides applied, and suppressing a certain pest can lead to increased spreading of another. The authors judge that the benefits generated by GM crops are harvested above all by the large seed corporations, but certainly not by small-scale farmers in developing countries. By contrast, the authors of an article in AgBioForum draw quite different conclusions. Based on quantitative analyses they state that farmers’ levels of income have risen significantly in developing countries such as Argentina, China, Brazil, or India. Moreover, according to their study the cultivation of GM crops has led to a pronounced reduction in the use of pesticides and in carbon dioxide emissions. > Who benefits from gm crops? An analysis of the global performance of gm crops (1996–2006). Friends of the Earth International. January 2007. 98 p.
Since the publication of the Brundtland Report 20 years ago, numerous instruments in support of sustainable development have been elaborated at both international and national levels. However, the causes underlying unsustainable development have hardly been tackled. Steve Bass states that government systems have not succeeded in integrating environmental factors, eradicating social injustices and developing new economic models. Economic growth is upheld as an inviolable principle. This is confirmed by the trends of the past 2 decades: new economic powers have developed, economy is being reshaped by globalisation, non-linear events are increasing both in frequency and in scale, and the risk of conflicts between “haves” and “have-nots” is growing – and yet motivation for developing big ideas is dwindling. Existing approaches to sustainable development must be enhanced and their focus shifted. Today it is necessary to make difficult decisions and set priorities; high-level public commitments will no longer do. Conceptual approaches must be combined with operational approaches. Poor populations and social movements must develop into driving forces for sustainable development, and their knowledge and traditional approaches must be integrated in the existing approaches. To prevent deforestation, to better control illegal activities and to generate equity of benefits, several countries now recognise the right of communities to own forest land and strive to transfer responsibilities for the forest to local jurisdictions. The assumption is that a delegation of such powers will offer the most disadvantaged greater opportunities. However, such a transition is not without obstacles, due in particular to the failures of processes to bring about structural changes. Based on a reappraisal of what “pro-poor forest policy” means, the author first identifies the challenges faced at international, national and local levels. Using country studies, she then re-examines these challenges in terms of the future of the forest sector over the next ten years. The originality of this report can be attributed to two features: its consideration of the “time” factor which is conducive to change and its wide-ranging analysis of the scope of institutional influence. With its extensive bibliography, statistics and practical applications, this publication could serve as a reference work for deciding on the direction of national forest policy. Source: Where in the world is there pro-poor forest policy and tenure reform? Mary Hobley. Rights+Resources, 2007. 91 p.
Agricultural practices such as terracing, compost application or intercropping are referred to as “low external input” technologies (LEIT). These technologies have a reputation of being particularly adequate for dissemination among poor rural households. Based on existing literature and three case studies in Honduras, Kenya and Sri Lanka, the author concludes that this is a wrong assumption. While he does not question the fact that LEIT increase productivity and help to reduce pressure on natural resources, experience shows that they are more likely to be successfully adopted by wealthy than by poor farmers. Poor rural households often generate a major share of their income by doing paid work, and as a result simply lack the time to learn about, and use, such labour-intensive technologies. Furthermore, experiences made during the project revealed that LEIT are not perceived and handed on as a “philosophy”. Instead, they are applied pragmatically, in combination with external inputs. According to the author, technology projects need to be very carefully evaluated, should be embedded in a broader rural development strategy, and must correspond to local demands. Flood management in Mozambique, food security in Ethiopia, malaria control in southern Africa, sustainable agriculture in Mali and drought insurance in Malawi have one thing in common: all of these projects must be able to rely on sound climate information. Africa has a high climate variability. Further aggravated by climate change, it threatens livelihoods, particularly those of the poorest, in various ways. This study uses detailed descriptions of five case studies to demonstrate how reliable climate information can contribute to reducing risks. However, especially in southern Africa, climate data of the necessary quality are often unavailable, or a lack of adequate communication and interpretation prevents them from being used as a basis for development decisions. The authors therefore recommend, among other things, that climate issues be systematically integrated as an important element in development projects. However, this requires the availability of reliable data, and their communication must be adapted to the various target groups. Improved networks and exchange of experience between centres of competence throughout Africa can increase the reliability of forecasts. Analysis of the economic value of climate data can help to strengthen their importance. Source: Climate risk management in Africa: learning from practice. Molly E. Hellmuth, Anne Moorhead, Madeleine C. Thomson, and Jim Williams (eds.). Climate and Society No 1. International Research Institute for Climate and Society. 2007. 116 p.
The idea is not new: to profit from the wealth of one mountain region in order to strengthen the livelihoods of local people of another mountain region. 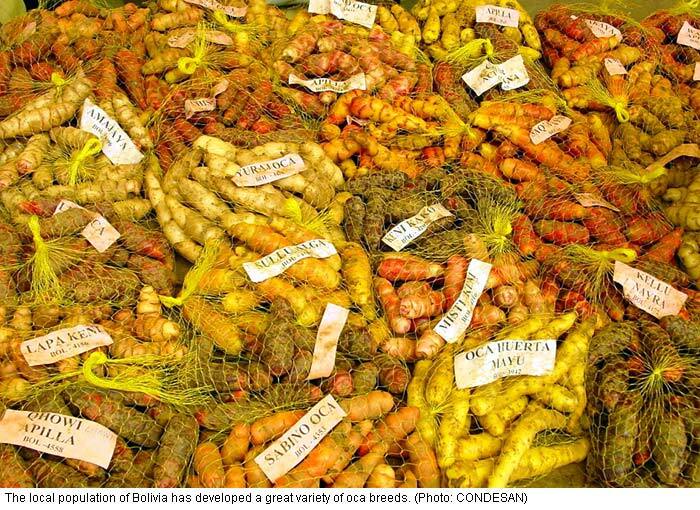 Centuries ago, potato and maize found their way from the Andes to the Himalayas. However, although the idea sounds tempting, its implementation is not easy. This is shown by the results of an e-conference between experts from the Himalayas and the Andes. Sustainable use of biodiversity cannot be guaranteed by simply transferring seeds or seedlings. It is just as important to convey traditional knowledge about ecological preconditions, use, and cultivation methods. However, those who have created and preserved this knowledge must be compensated in an equitable way for conveying it. Legal frameworks for this purpose have already been created, particularly in the Andes, but their implementation is lagging behind. Biodiversity registers can play a key role in securing the rights of local populations. However, creating these registers is a complex task which must be based on the local population’s perspective; moreover, the registers must remain in the hands of the local communities. This is demonstrated by A. Argumedo and M. Pimbert, using the example of the innovative “Indigenous Biocultural Heritage Registers“ of the Potato Park in Peru. Whether walking in the field, travelling on the bus or during working sessions indoors, 15 representatives from forest landscape restoration projects across the world exchanged their experiences during a study tour in Spain and Portugal. Forests which undergo restoration have been subject to immense pressure in the past. The success of such projects depends on reconciling biodiversity conservation with the needs of the local population. The similarities which emerged from the study were surprising. While tree planting in targeted areas of Eastern Africa and Northern Borneo have helped to restore some key forest functions, more action is needed to ensure the complete restoration of the forest landscape. Gaining the confidence of the different stakeholders is vital to long-term sustainability. In Argentina, for example, the scale of the project and the large number of stakeholders concerned has led to tensions. In Madagascar, given their high dependency on forests for their survival, local populations are wary of such projects. However, in Tanzania, the problem of the monopoly exerted by large tea producers on forest services (biodiversity and fuel needed to dry tea) was resolved by the introduction of other services which generate local benefits, such as water and medicinal plants. Source: Five years of implementing forest landscape restoration: Lessons to date. Nigel Dudley. WWF, 2007. 22 p.
Timber and timber products from illegal logging account for 6 to 8% of all timber imported to Switzerland, and they have been the subject of many controversies over the past years. 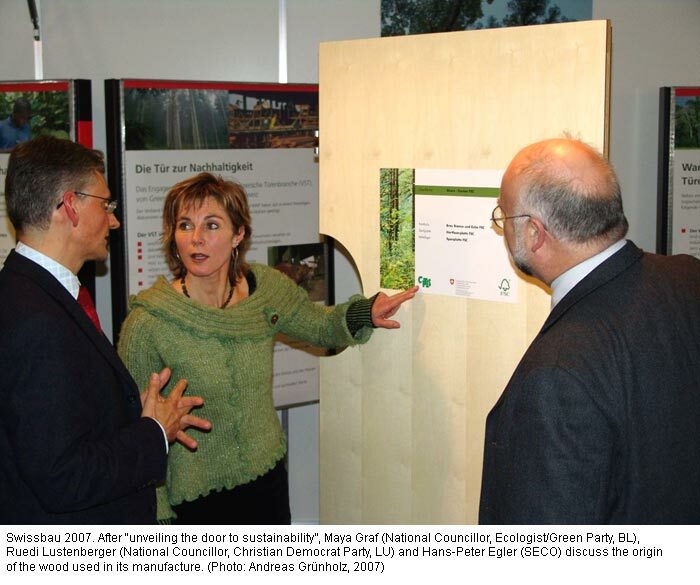 “Illegally cut timber is not welcome on the market”: this was the topic of a panel debate among politicians, economists and Swiss NGO representatives at the Swiss building fair in Basel (23–27 January 2007). At a public stand a voluntary agreement between the Swiss Door Manufacturers’ Association (Verband Schweizerische Türbranche, VST) and two environmental NGOs, Greenpeace Switzerland and WWF Switzerland was explained. The “unveiling of the door to sustainability” after the panel debate reflected the effort and willingness of the VST to combat trade in illegal timber and support sustainable management of tropical forests. Not only does ecologically sound and controlled forest management preserve the Earth’s “green lungs”, but it also provides jobs and income opportunities for indigenous communities. However, illegal timber can only be stopped from flowing onto the market if consumers carefully check certificates and declarations when buying timber products.